NFPA 3 is the first and only Standard with a complete commissioning program for fire protection and life safety systems. Updated, renamed, and approved as a Standard, NFPA 3, Standard for Commissioning of Fire Protection and Life Safety Systems was originally developed in response to a request from the National Institute of Building Science (NIBS). It serves a critical need in the built environment by giving stakeholders a process for the commissioning of fire protection and life safety systems, to help them verify that systems are designed, installed, and function as intended. NFPA 3 works with NFPA 4, Standard for Integrated Fire Protection and Life Safety System Testing. Numerous updates throughout the 2018 edition were made to reflect the transition from recommendations to mandatory requirements. Many chapter requirements were reorganized and moved to other chapters to make the Standard more useable. Compliance helps stakeholders ensure commissioning is done correctly, in every building regardless of age and designated use. 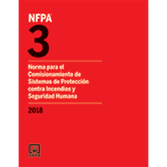 Interested in other editions of NFPA 3? Use the drop down menu above to select the edition year you need.